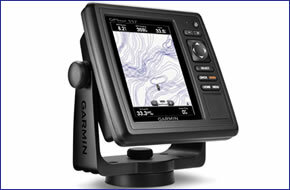 The latest chartplotter from Garmin are the GPSMAP 557 and 557xs which both feature a 5-inch colour display. They are wifi, bluetooth and Fusion link enabled. The 557/557xs both come preloaded with BlueChart g2 UK and Ireland marine charts and a worldwide basemap. The difference between the 557 and 557xs is the xs version comes with a sounder for defining depth contours, finding fish and locating objects underwater. You will need to purchase a transducer to enable the sounder to operate. The 557 benefits from a GLONASS GPS receiver for better GPS positioning updating 10 times a second to find fishing spots. There is a fast processor for quick panning and zooming and the screen is viewable in bright, direct sunlight. Garmin GPSMAP 557/557xs has been discontinued. Accessories, spares and parts are still available for your GPSMAP 557/557xs, as are marine BlueCharts. The GPSMAP 557 is a compact chartplotter for use on the water. The 557 features high resolution, super-bright 5-inch VGA colour display. The 557 is waterproof to IPX7 standards and the screen has also been enhanced to speed up the map drawing and panning features. The 557 is also wifi and bluetooth enabled. It is also Fusion Link capable enabling you to connect to other devices with ease. The GPSMAP 557 comes preloaded with marine charts for the UK and Ireland. There is also a basemap with satellite images. To make navigation quick and simple there is a high-sensitivity GPS receiver. In addition there is a GLONASS GPS receiver which works at 10Hz and updates position 10 times a second making it ideal when navigating to find a hot fishing spot quickly. You can also quickly mark and navigate to 5,000 waypoints or 100 routes. ‣Transom Mount - for outboard powered boats and fits to the transom of the boat. ‣In-hull mount - for non-outboard powered boats for only single skin fibre glass boats. ‣Through-hull mount - for non-outboard powered boats. Ideal for wooden, steel boats, etc. To find the perfect transducer to partner your GPSMAP 557xs and your boat please complete our online form here. Pictured below, transom mounted transducer, thru-hull transducer and in-hull transducer. The 557xs also has an alarm for fish size, shallow and deep water. The GPSMAP 557 has an SD card slot so you can add additional mapping capabilities to the system. These extra features include 3D Mariners Eye for 3D information above the waterline and 3D Fish Eye for 3D information below the waterline. These g2 vision maps also feature high-resolution satellite images for help when navigating unfamiliar waters. There is also an Auto Guidance feature that will navigate you along you chosen route avoiding shallow water, buoys and other obstacles. Both the GPSMAP 557 and 557XS are NMEA 2000-compatible making it simple to connect to sensors, instruments and future marine products providing information such as engine, fuel, wind, VHF, autopilot and other data monitoring. Please note: The Garmin GPSMAP 557 is equivalent to the GPSMAP 527, the difference being that the GPSMAP 527 is preloaded with North American BlueChart. The GPSMAP 557 is preloaded with UK and Ireland BlueCharts and is the model that is destined for the UK/European market. Garmin GPSMAP 557 and 557xs marine chartplotters are preloaded with Garmin BlueChart g2 UK and Ireland mapping (pictured right). In future years you can purchase a marine map update SD card to update the preloaded UK and Ireland charts on the Garmin GPSMAP 557/557xs. 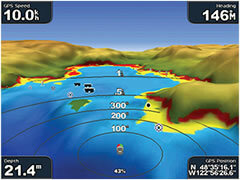 Looking for Garmin GPSMAP 557 or GPSMAP 557xs accessories? Accessories available to purchase include protective cover, flush mount kit and second mounting station. To view them all click here. If you'd like to add a transducer to your GPSMAP 557xs please see this page. Add Garmin BlueChart g2 HD and g2 Vision HD marine charts to your Garmin GPSMAP 557/556s, view the different charts you can buy from ActiveGPS here.